Scientists have created a "blueprint" of the genome of a songbird. The advance, described in the journal Nature, could reveal some of the evolutionary secrets of vocal learning in animals, including humans. The researchers say it will aid the study the genetics of speech disorders, such as those related to autism, stuttering and Parkinson's Disease. The international research team was led by Dr Wesley Warren from the Washington University in St Louis, US. "The zebra finch is a beautiful model for vocal learning," Dr Warren said. 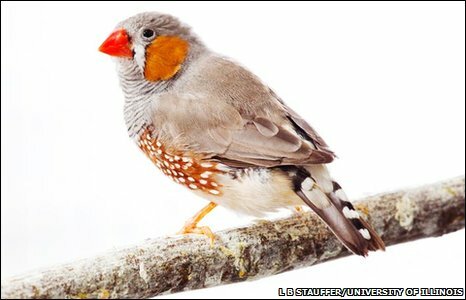 He explained to BBC News that earlier research had shown that certain genes in the brains of zebra finches were activated when the male birds heard a familiar song. "We looked for the position of these genes in the bird's genome, and then looked for the [equivalent] genes in the chicken genome," he explained. The chicken is the only other bird to have had its genome fully sequenced. And by comparing the chicken genome to that of a songbird, the scientists were able to identify genes that were most important in vocalisation and song-learning. Dr Warren said that he and his colleagues looked at which genes changed as vocal communication evolved. To reveal this, the team worked out what the genome of a common ancestor of both birds would look like . "Then we looked for genes that had changed faster in the zebra finch than we would have expected," said Dr Warren. "This shows that there was a [natural] selection pressure on those genes." This revealed the steps - the tiny molecular changes within each gene - that were most likely to have been associated with the evolution of vocal communication. Dr Richard Wilson, director of Washington University's Genome Center and another senior researcher involved in the study said: "Now we can look deep into the genome, not just at the genes involved in vocal learning, but at the complex ways in which they are regulated." "There are layers and layers of complexity that we're just beginning to see. This information provides clues to how vocal learning occurs at the most basic molecular level in birds and in people." Dr Warren said that the findings would take the research "into the human realm". "We can start to look at the structure of those genes in humans with stuttering, autism, Parkinson's Disease and a lot of other neurological disorders [where speech is affected] to see if they're altered in any way." Dr Carlos Botero, a specialist in animal communication from Duke University in the US said that this work brought us "a little bit closer to understanding the links between genes and behaviour." Dr Botero, who was not involved in this study, added: "These results should be appealing not only to those interested in the evolution of song or communication but also to anyone who has ever wondered how the tiny little molecules in our genes can ultimately influence what we are and what we are able to do."